You must be a member of the Dubai Desert Camping Group to attend this activity. Would you like to join this group? 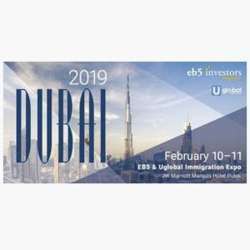 EB5 Investors Magazine & Uglobal Immigration Magazine are pleased to bring the investment immigration industry’s premier networking and educational conference to Dubai. This two-day event will include panels moderated by experienced professionals, exhibitor hall for sponsors, and ample networking opportunities to meet with local migration agencies and potential investors. Join our event to build strong overseas partnerships while staying up to date on current trends, emerging markets and best practices.